Snack, sandwich spread, topping, or sauce. Sweet or savory. Peanut butter is your kitchen’s high-protein staple. Whether you want more protein so you can build muscle or more fiber so you can stick to your diet, the nutrients in peanut butter are a great help during hard workouts or hard days at the office. Definitely a must-have. 350 peanuts in one jar. Our peanut butter has everything. No frills necessary. Just pure peanuts, gently ground into a smooth spread. But the truly amazing thing is just one jar contains 350 whole peanuts, including the shells. Your body will totally love the vitamins and minerals in every single part of every single peanut. We want our peanut butter to be a fulltaste experience. That's why we do without the use of genetic engineering andartificial additives. You won't find any additives like palm oil, salt, orsugar either. Our peanut butter is 100% pure and natural product. No bullshitallowed. A varied and balanced diet and a healthy lifestyle are essential. Not suitable for people with peanut allergies. May contain traces of nuts and sesame seeds. Peanut butter is perfect as a spread and for cooking, baking, or enhancing various dishes. If you’re trying to lose weight we recommend using peanutbutter sparingly because of its relatively high fat content. Add 1-2 tbsp. of peanut butter to your morning muesli or porridge (link) or a post-workout protein shake for an added touch of creaminess. The combination of protein and healthy fats you'll get by combining our peanut butter with our whey protein provides your body with the energy it needs for optimal regeneration. Guys, I really appreciate what you do and the way you do it. One of the best in the market of healthy sport food. Your peanut butter is quite good, but to my personal taste I would prefer another one, because I tried a lot of different brands who make peanut butter without any extra ingredients (maybe only salt). My #1 is from US, WholeFoods shop, it is made by 365 Everyday Value brand, called Peanut Butter Crunchy with salt (I can send you link later if needed). They do not deliver to Europe, so I prefer yours for the moment. But if you can add similar crunchy roasted version to your product line (even without salt), would be PERFECT! I absolutely love this organic peanut butter. It tastes great, even without added sugar. It is really creamy and it not oily, like a lot of organic peanut butters. I eat it with apple slices for a healthy, protein-rich dessert! Come consistenza ricorda molto il classico pesto di pistacchi. Per chi ama le arachidi è un must. Ottimo con le mele. Occhio alle calorie ! Very good product! Good taste and good composition. A very high quality peanut butter which you can add to anything, it's great value for money. Love peanuts and love this peanut butter. so natural. foodspring instantly caught my eye - been looking for something like that for ages. this peanut butter tastes perfect pure or when used to cook. organic ftw! Who should use organic peanut butter? Nuts are one of the most nutritious foods there is and the perfect energising snack whether you're at home or on the go. And peanuts are among the most popular, often eaten as an evening snack while watching TV. Nowadays, peanut butter is marketed as a so-called functional food, easier to integrate into your everyday diet. It's perfect for a healthy and balanced lifestyle and is extremely versatile. 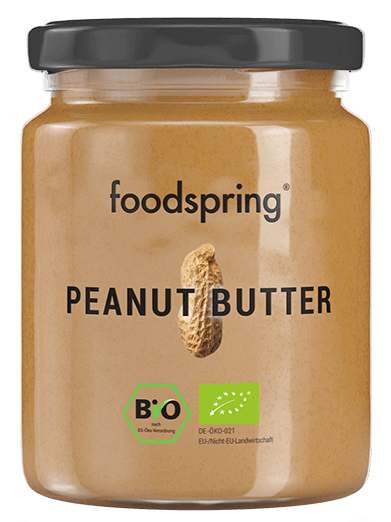 Organic peanut butter by foodspring is produced as a "creamy" variation, characterised by an extremely gentle and natural production process. We process the whole peanut, including skin and then roast them. Peanut shells contain a large amount of nutrients, so we leave them on. In the final step, the peanut butter is ground to a smooth and creamy paste. It takes 350 whole peanuts to make just one jar of peanut butter. Unlike other peanut butter products on the market, we do not use additional oils, flavourings or artificial additives in our organic product. Using a natural and gentle manufacturing process we produce peanut butter with a unique taste and the perfect consistency, in 100% organic quality. Organic peanut butter is a real powerhouse and the perfect all-rounder in terms of nutrients for our body. Organic peanut butter is made up of almost 25% protein and provides the body with a variety of amino acids for building and repairing muscles. Peanut butter is also rich in vitamins and minerals like iron, phosphorus, magnesium, calcium, vitamin B3 and vitamin E.
Dietary fats and polyunsaturated fatty acids make up the largest proportion of nutrients. Scientific studies have shown that consuming unsaturated fats from nuts, oils or avocados is significantly healthier for our body than saturated or trans fats from processed foods. The easiest way to use peanut butter is as a sandwich spread or as an ingredient in homemade smoothies or protein shakes. Combining peanut butter with whey protein allows you to create your own interesting flavours. But peanut butter makes a perfect sandwich spread or topping for muesli, porridge and pancakes. If you like preparing Indian or oriental-style dishes, peanut butter is the perfect ingredient for savoury and spicy sauces. Organic peanut butter is extremely versatile. However, you should be aware that most of the calories in peanut butter come from fat. Since 1 gram of dietary fat accounts for 9 calories, peanut butter should be used sparingly, especially if you're trying to lose weight. Less is more in this case. Organic peanut butter is ideal as a supplement for your muscle building diet. For successful muscle building a so-called calorie surplus is required. Only when the body has a positive energy balance can it be supplied with the necessary materials to build new muscle tissue. Thanks to its high nutrient density, peanut butter is an ideal snack for muscle building. Peanut butter is particularly rich in high-quality protein and the amino acid L-arginine. This amino acid plays an important role in transporting oxygen. Minerals like zinc and calcium are also found in high concentrations in peanut butter. The supply of these micro nutrients is important, because muscle building places a great strain on the muscles and their performance. When it comes to muscle building, the greatest benefit of peanut butter is the rich content of polyunsaturated fatty acids. Organic peanut butter is perfect for anyone who values a balanced and healthy diet and peanut lovers, of course. Peanut butter's versatility makes it a really smart ingredient for cooking. It is the perfect addition to smoothies, shakes, sauces and muesli. Peanut butter can also be used by athletes who are looking for a high-calorie snack for muscle building. 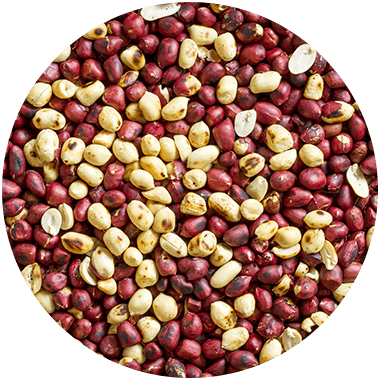 The full nutrient profile made up of high-quality protein, healthy fats, vitamins and minerals meets all the requirements of a protein-rich diet. In terms of taste, organic peanut butter is a lot more intense than conventional peanut butter. This is largely down to the manufacturing process. By dispensing with additives like oils, sugar, flavourings and preservatives, a 100% organic method of production can be achieved. Organic peanut butter has an optimal nutritional profile. It is produced without the use of chemical synthetic pesticides. That's why organic quality should have the highest priority when buying peanut butter. foodspring organic peanut butter is made from organic peanuts, which are roasted together with the natural brown shell and then ground to a velvety smooth paste. The natural production process gives the peanut butter an intense and characteristic flavour. The result is an organic product with no harmful additives. Why do you use the whole peanut? Why shouldn’t we? Peanut shells contain excellent nutrients that provide an extra nutritional boost. What’s more, they’re the reason our peanut butter has such an intense flavor. We take the best-available ingredients and combine them in one jar: peanuts and shells. Nothing more. Nothing less. What does “organic-quality peanut butter” even mean? 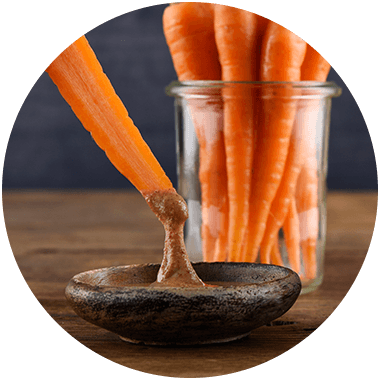 Organic peanut butter means that all-natural raw ingredients are used. No artificial additives and no irradiated peanuts. And of course, our peanut butter also contains no genetically modified ingredients. Why don’t you use any artificial additives? At foodsprin, premium quality means authentic flavor without any artificial additives. That's why our peanut butter doesn’t contain any flavor enhancers like sugar, salt, or oil. Why do you use so many peanuts? It takes 350 whole peanuts to make just one jar of our peanut butter. That’s how we can pack in so many nutrients and give our peanut butter a totally authentic flavor. That's why we don’t need to use any flavor enhancers. What’s the best way to use peanut butter? Peanut butter is great as a sandwich spread, a protein-rich snack, or as a simple upgrade for a nutritious smoothie. You can also use it as a base for savory sauces or as a pancake or muesli topping and turn any dish into a high-protein meal. Peanut Butter will be back in stock shortly.